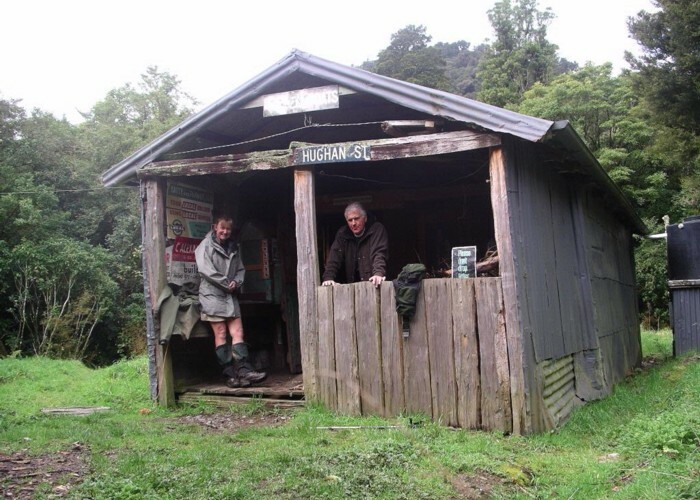 A well maintained historic, but functional hut on the Waiohine River flats in the Tararuas. A beautiful hut, harkening back to the days when huts were one-offs built by people, not mass produced by government departments. When individuality, ingenuity and rats were essential ingredients. Most of the construction is from locally available timber. An assortment of carried-in and bush-made windowframes adorn the walls, as does a collection of original NZFS signs - they were fierce on the subject of fires, for some reason. The hut sleeps 6 on bunks (and has matresses) - but is large for a 6-bunk hut and could easily accommodate another 6 on the floor. There's an open fire, plenty of firewood and tank water piped from the creek. The hut doesn't get a great deal of use, though a couple of parties a month pop in, many hunters. This is a quiet alternative to Totora Flats, or an interesting destination in and of itself. Sayer Hut Sep '04 • By MurrayL. Waiohine true left. Upriver (Totora Flats hut / bridge, 0.5-1hr) tracked for 1km, then 1km riverrocks / bushbashing. Tararua Creek tough after heavy rain. Downriver river: WaiohoineRoadend: reportedly possible? Added 19 July 2010 by madpommadpom. 1 revision 21 June 2011 by iangeorgeiangeorge. 399 views in the past year (33 per month).